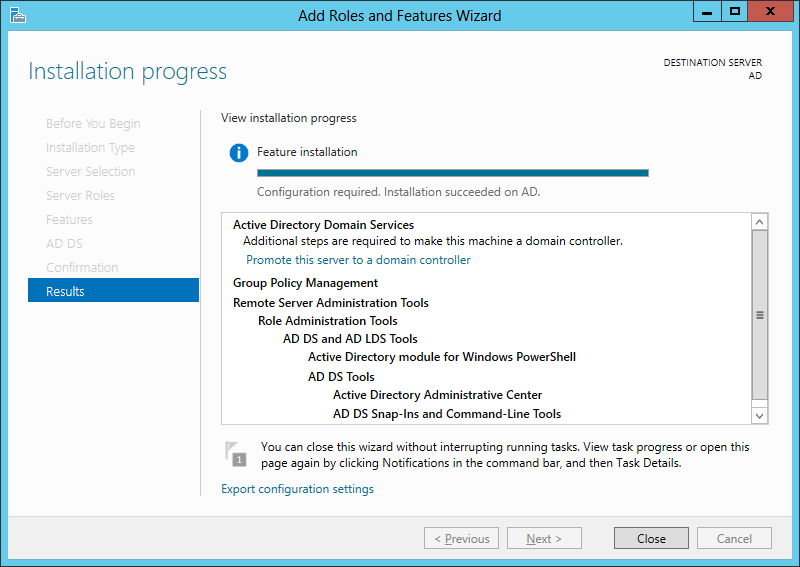 Now that we have the VMs created, and the OS installed on both, we need to first install/setup Active Directory (AD). 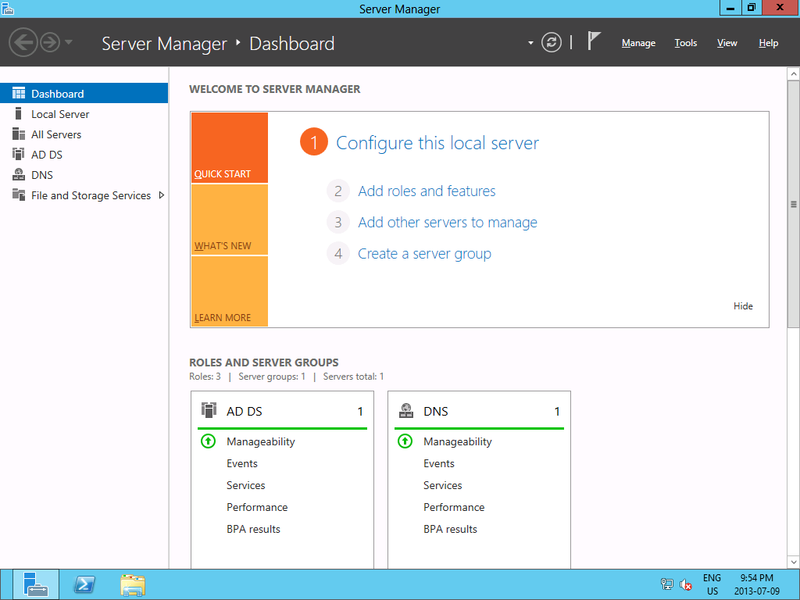 When you log into a new installation of Server 2012, Server Manager will auto launch. 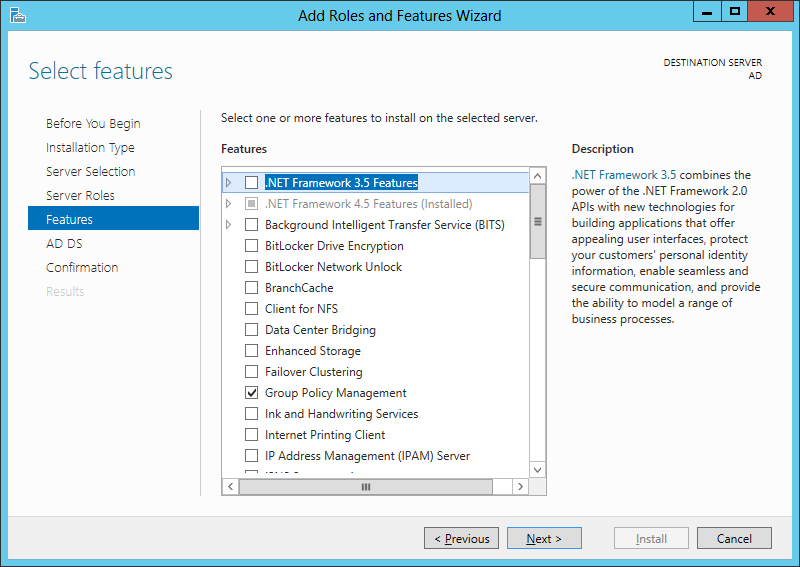 From Server Manager, click on Manage, and choose ‘Add Roles and Features’. 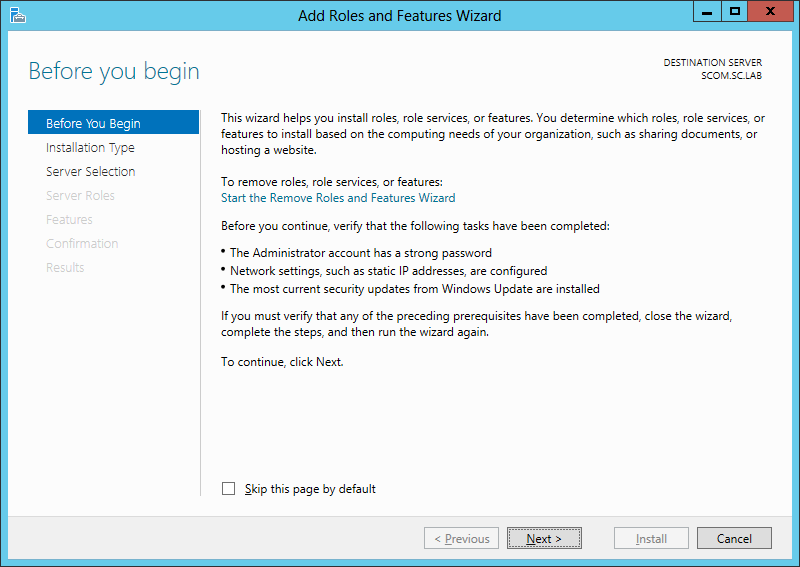 On the Add Roles and Features Wizard, read the information on the Before You Begin dialog, and then click Next. 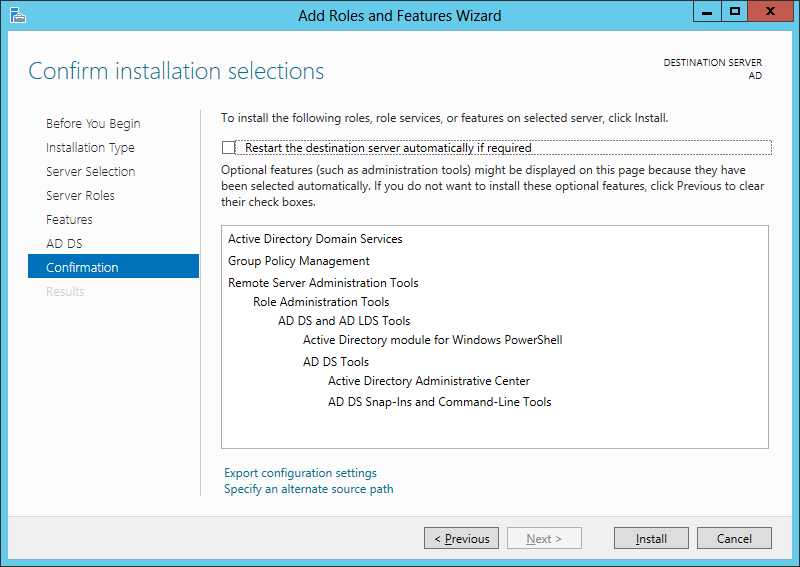 On the Installation Type screen, select ‘Role-based on feature-based installation’ and then click Next. On the ‘Server Selection’ screen, since we are installed Active Directory on this local system, ensure that it is selected, and click Next. 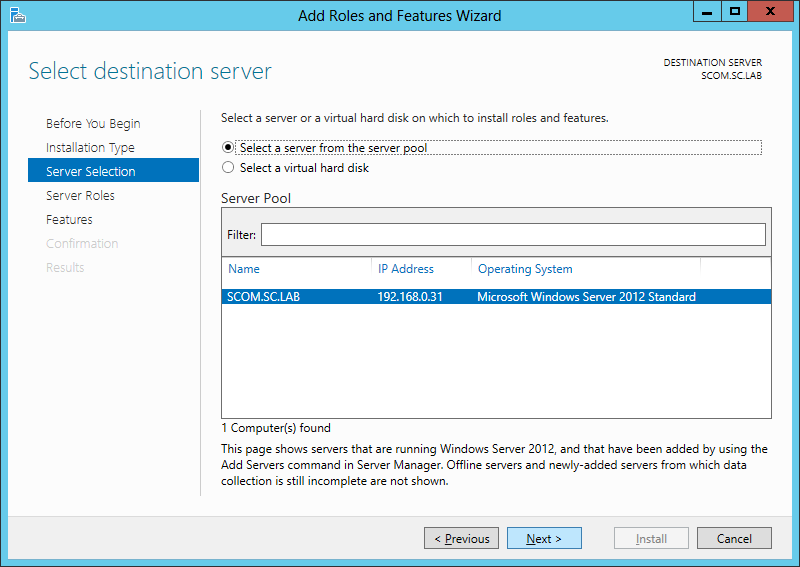 Side note: Windows Server 2012 has a new feature that allows you to remotely install Roles and Features on other systems. 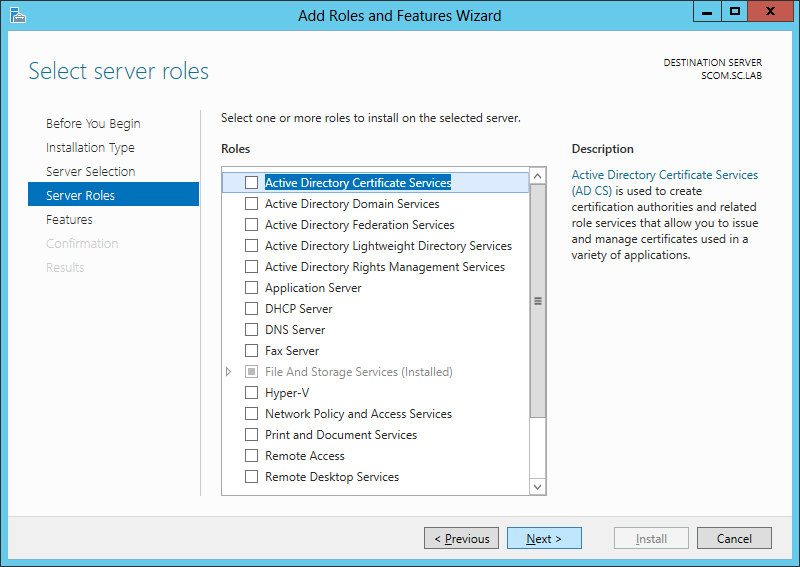 On the Server Roles screen, select ‘Active Directory Domain Services’. 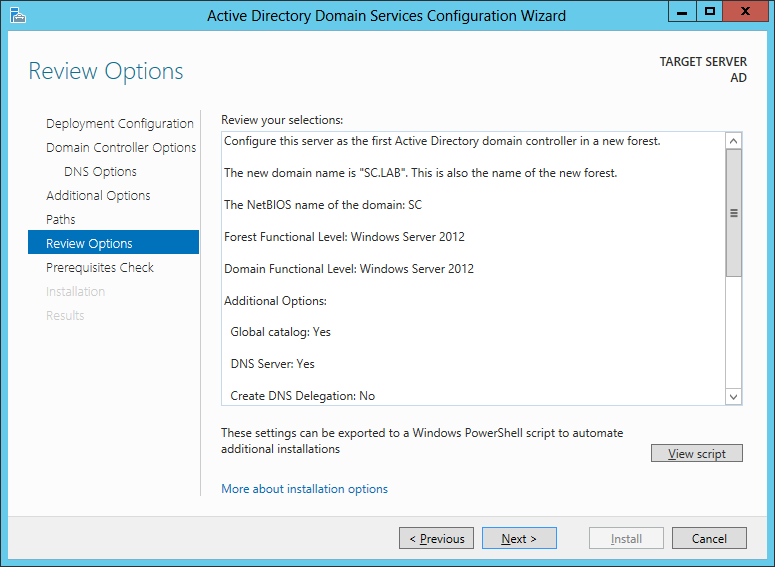 When you select ‘Active Directory Domain Services’, immediately you will be presented with the following dialog. Click Add Features. On the Features screen, accept what has already been selected by default, and click Next. On the AD DS screen, read the information presented, and click Next. On the Confirmation screen, check the ‘Restart the destination server automatically if required’ checkbox, and then click Install. Note: You are not required to check the ‘restart’ checkbox, however, you’re going to have to restart the system anyways after the installation, so you might as well let the system do it for you. Note: When you check off the ‘Restart the destination server automatically if required’ checkbox, you will immediately be prompted with the following dialog. Click Yes. On the Results screen, click Close. 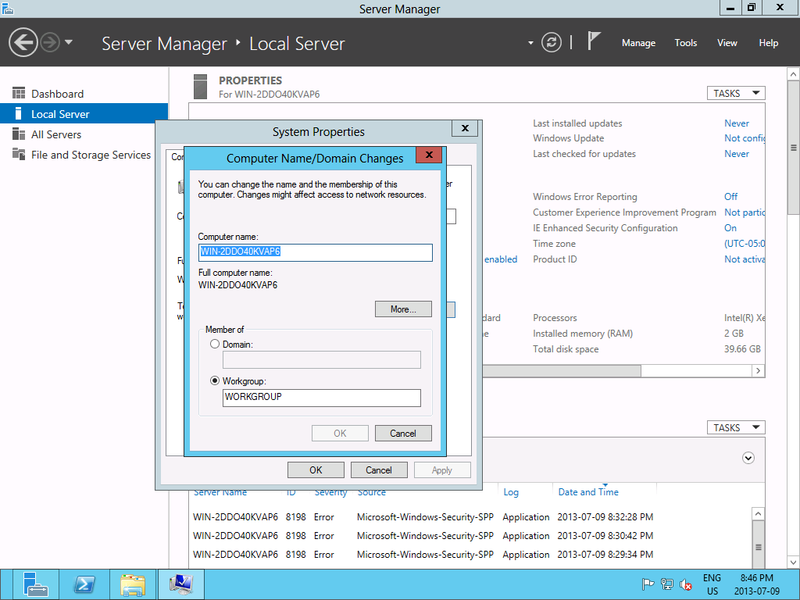 After the system restarts, and Server Manager launches, you will have to promote the server as a domain controller. 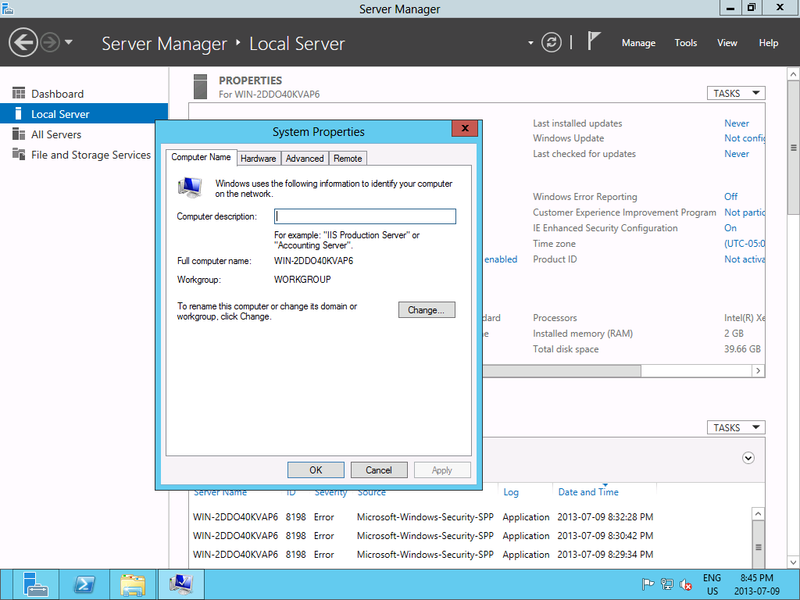 This is because Active Directory has been installed, but that process does not automatically promote the server. 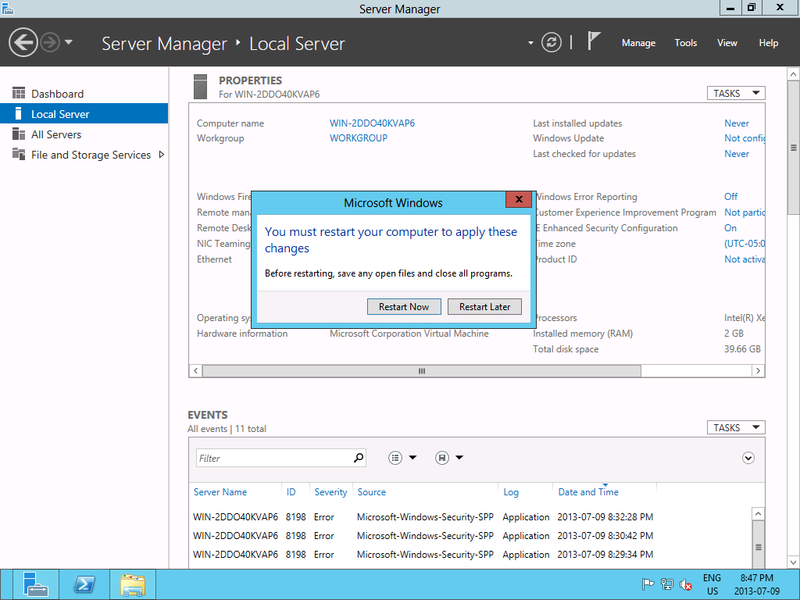 Click on the ‘Promote this server to a domain controller’ link. 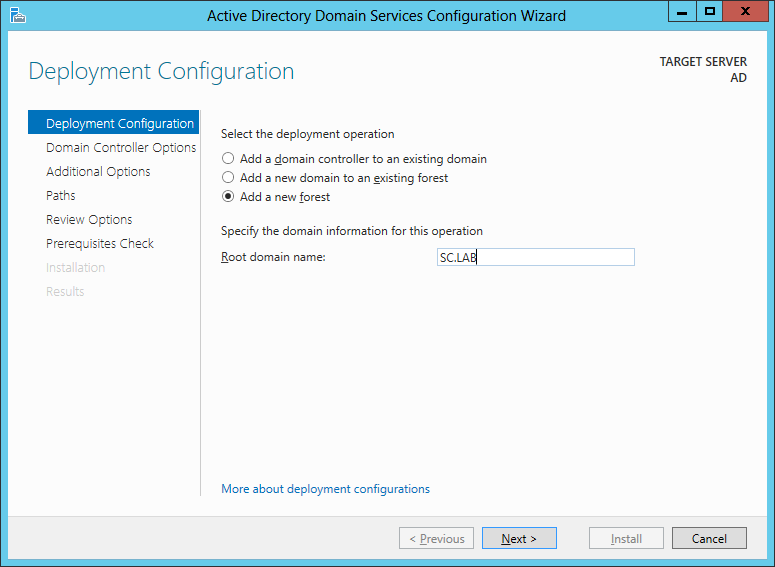 On the Deployment Configuration screen, select ‘Add a new forest’ since this is the first domain controller in our lab. Then enter a root domain name, and click Next. In my example I am using “SC.LAB” for System Center Lab (since I will be installing all other System Center products in my lab eventually). 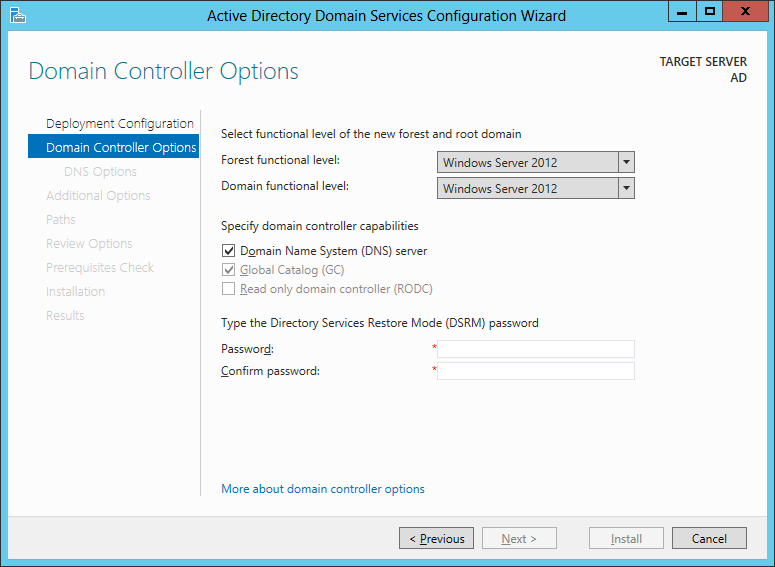 For the Domain Controller Options, select the appropriate Forest functional level, and Domain functional level. 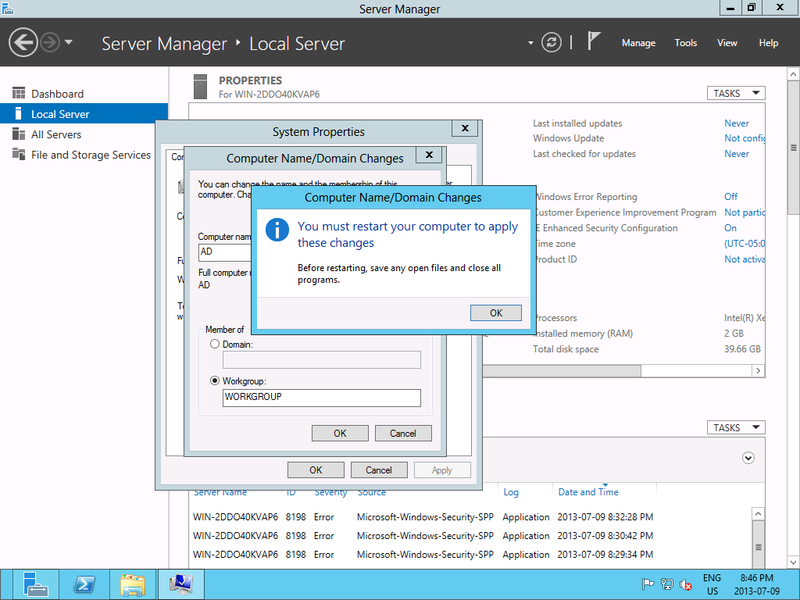 This is more applicable if you already have an existing domain and are adding a new domain controller. 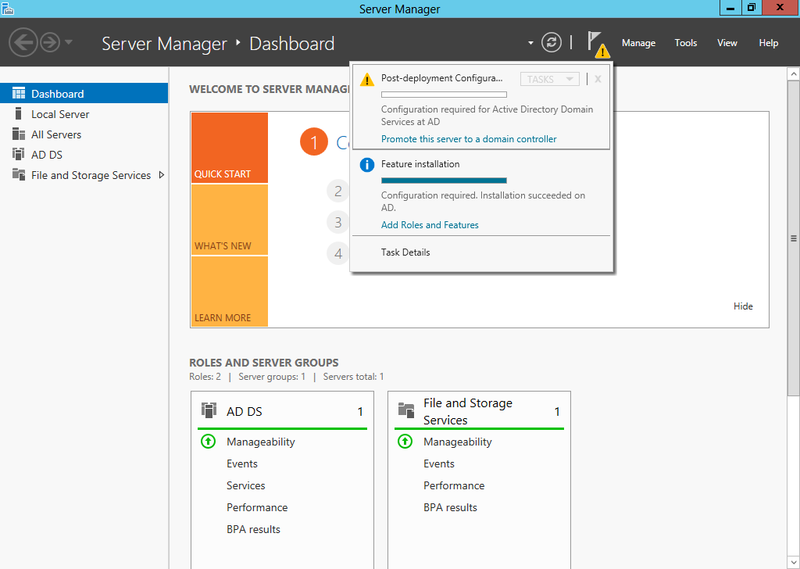 But since this is the first domain controller in our new domain, then we’ll use the highest level, that of Windows Server 2012. Also, don’t forget to create the Directory Service Restore Mode password. Then press Next. 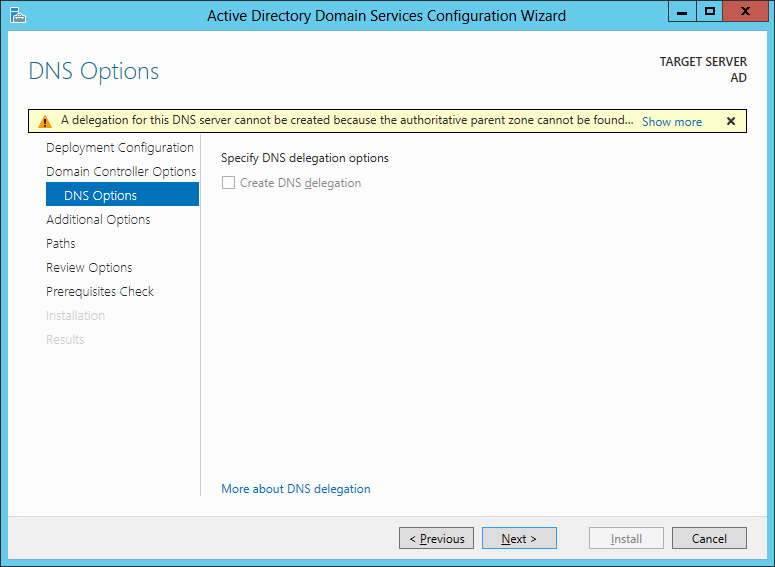 On the DNS Options screen, you can ignore this warning message and click Next. On the Additional Options screen, click Next. On the Paths screen, normally you would change the location for the database, log files, and SYSVOL, but since we are just in a lab environment, we’ll leave it at the defaults and click Next. On the Review Options scree, review what you have entered/selected, and click Next. 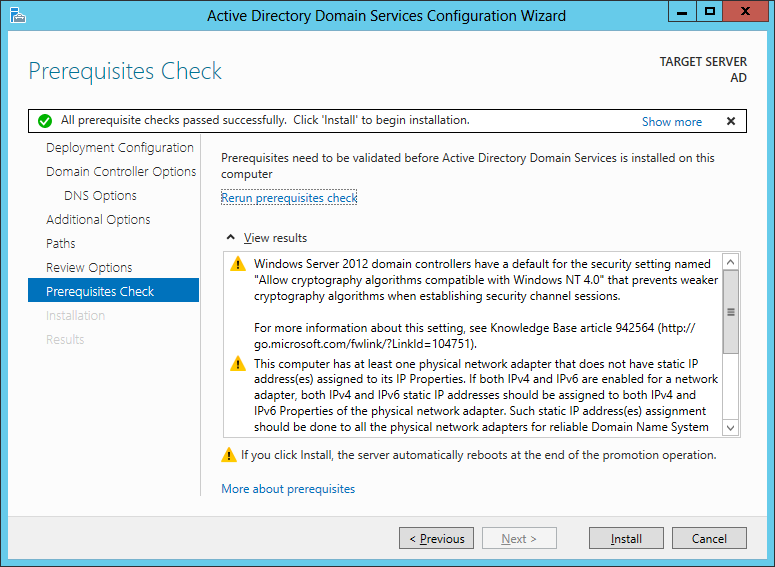 The Prerequisites Check screen will check and confirm that everything passes before promoting the system as a domain controller. You will notice in my screenshot, that I have 1 warning because I didn’t set a static IP for the server yet. After installation completes, the system will automatically restart. You will then be presented with the login screen. Something to note here, that because we were originally logged in with a local account, the first time you want to log on using a domain account you will have to type the domainusername; in my example SCAdministrator. 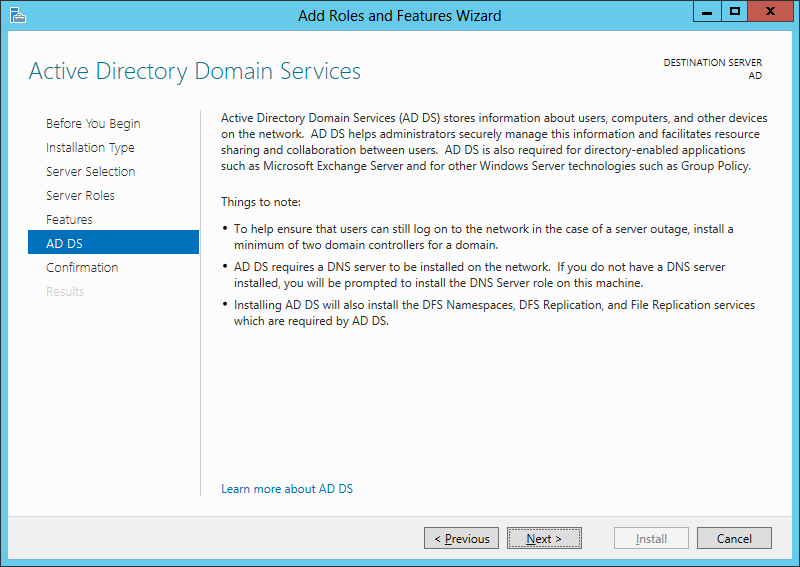 When you login, you will then see in the Server Manager, that AD DS is now listed, along with DNS. 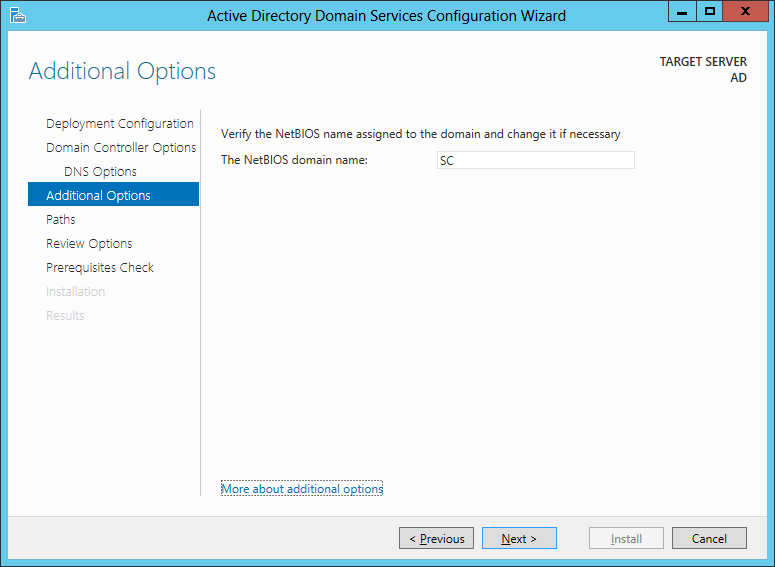 Now all that you need to do is assign a static IP to your domain controller. 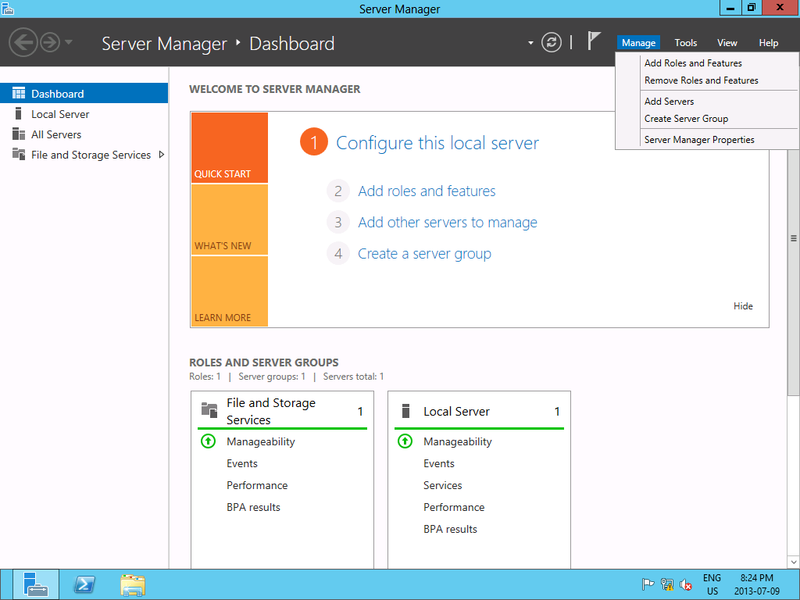 To do this, in Server Manager, select Local Server from the panel on the left. From there, click on the Ethernet link labelled ‘IPv4 address assigned by DHCP, IPv6 enabled’. This will cause the Networks Connections explorer to open. From here, right click on the Ethernet network that is displayed. This is in fact the network connection that we configured when we first created the VM. On the Ethernet Properties dialog, select ‘Internet Protocol Version 4 (TCP/IPv4)’ and click the Properties button. Within the Internet Protocol Version 4 (TCP/IPv4) Properties dialog, enter a static IP, gateway, and DNS that is applicable to your network. Once all the items have been entered, click OK. You will also have to click Close on the Ethernet Properties dialog as well. Congratulations, you now have a domain setup in your lab environment. 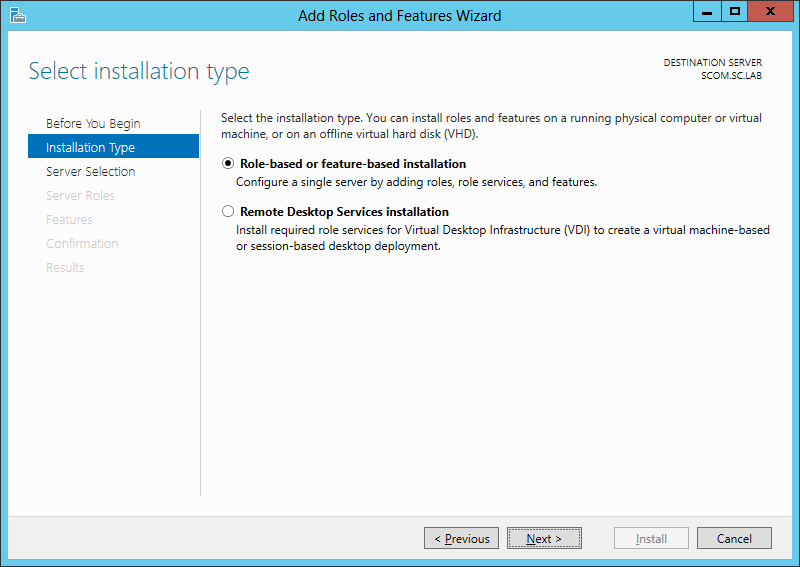 Now that you have your domain setup, you need to add your other VM (the one that you will use for installing each of the System Center products) to the domain before being able to install the product. Log into the system you want to add to the domain. 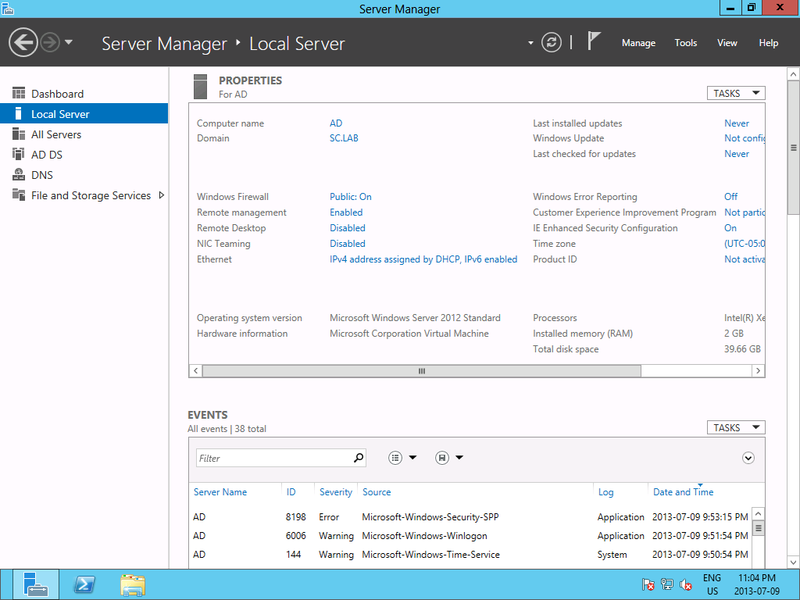 To do this in Server 2012, launch Server Manager, and click on Local Server. 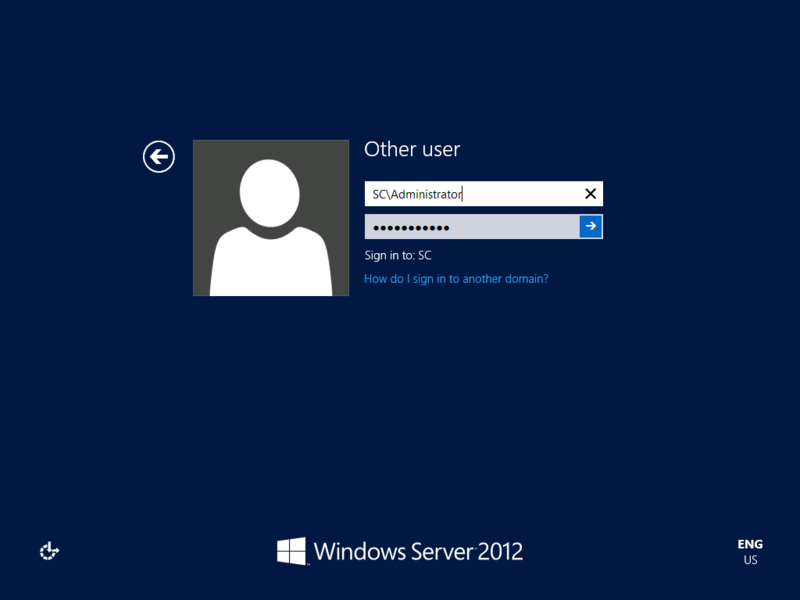 From this dialog, select the Domain option for ‘Member of’, and enter the domain name you want to join and press OK.
After pressing OK, you are immediately presented with a Windows Security dialog, in which you need to enter the credentials of an account that has Domain Admin rights. Enter the credentials and click OK.
Once the system is successfully joined to the domain, you will receive the following Welcome message. Press OK.
After you press OK to the Welcome message, you will receive a second prompt, indicating that you need to restart the system for the changes to take effect. You will be back on the System Properties dialog. Press Close. When you press Close, you will receive yet another prompt about restarting the system. You can choose to Restart Now or Restart Later, but you won’t be able to install System Center without the VM being added to the domain. After the system restarts, you will then be presented with the login screen. Something to note here, that because we were originally logged in with a local account, the first time you want to log on using a domain account you will have to type the domainusername; in my example SCAdministrator. Now we have our Active Directory server setup and ready, and the VM we will be installing System Center on is joined to the domain. If you are like me, you usually rebuild your lab environment continually. 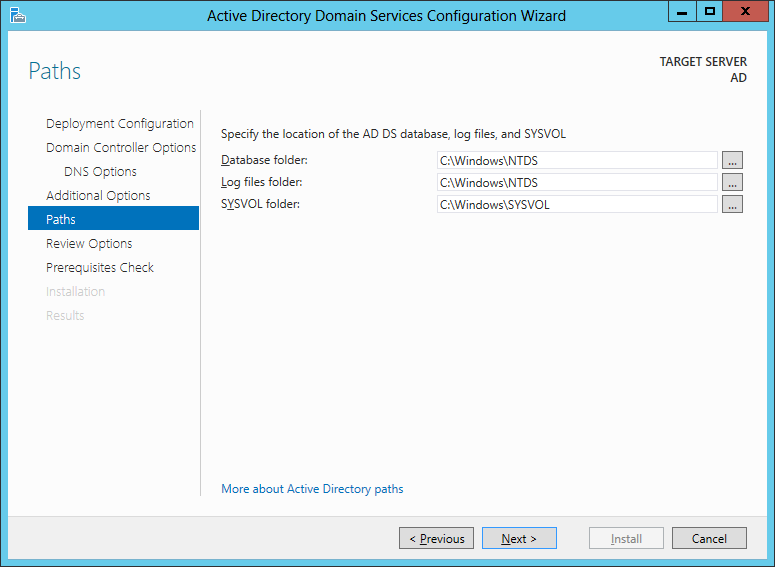 But, if you are trying to work through a scenario for a client, or test something out, you need some test accounts in Active Directory to represent multiple users. Instead of creating individual accounts, why not script it? I found the follow article that uses PowerShell and a list of randomly generated names, to populate Active Directory with 50, 200 User Accounts! Give it a try if you need many accounts for your environment. Now we can move onto installing SQL Server.